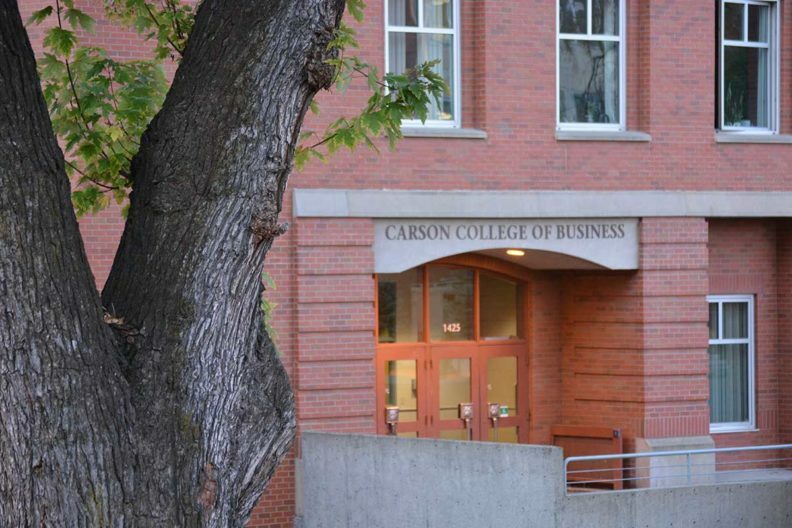 The WSU Center for Entrepreneurial Studies (CES) in the Carson College of Business is expanding programs and services for innovative students, faculty and staff. Entrepreneurial services and other support for students, faculty and staff are being expanded. The WSU Center for Entrepreneurial Studies (CES) in the Carson College of Business has recently launched several key programs and hired a new student venture manager to continue growing entrepreneurial service offerings across the University. The CES works extensively with other WSU units to encourage a culture of greater student and faculty involvement in innovative, entrepreneurial endeavors. The CES is designed to serve as a place for passionate people to join a project, pursue an idea, or to work on solutions that matter locally and globally. As one recent example, bioengineering students Emily Willard and Katherine Brandenstein launched their company, Engage Biotech, with mentorship from the CES. Their product is SafeShot, an innovative prototype of a lid that attaches to and sterilizes multi-use vials used to give vaccines and other critical medications throughout the developing world. Allison Sellers has recently joined the CES as the student venture manager. She will help facilitate the expansion of entrepreneurial growth at WSU through the collaborative design and implementation of the CES’s new, student-facing, entrepreneurship programs launching this year. In addition, the CES has recently expanded its programs and services to better serve innovative WSU students, faculty, and staff. “Our goal is to provide entrepreneurial opportunities for every student and faculty member interested in pursuing or participating in an idea,” said Marie Mayes, CES director. For the innovators, entrepreneurs, and those curious about entrepreneurship across WSU, the CES offers a diverse set of programs that focus on venture creation and launch. WSU, in conjunction with CES, recently launched the Amazon Catalyst program. The program fosters faculty and student innovation that will strive to solve real-world problems on a large scale. The CES offers a University-wide Business Plan Competition open to all WSU students. It also provides several events to help students prepare for the Business Plan Competition, including Partnering and Pitches teaming events and a six-week Resource Nights speaker series. The CES also helps facilitate student entrepreneurship clubs and organizations. The CES plans to move into the Commons Building in February, beginning the first phase of a campus-wide entrepreneurship facility designed to help students connect with diverse faculty and other innovative students on campus. Additionally, the facility will house the Jones Milestone Accelerator, the Terry Sparks Program, and a mentor connection platform that will enable students to connect with industry experts and community advocates. For more information, visit the Center for Entrepreneurial Studies, or contact Allison Sellers at 509-335-7876 or allison.sellers@wsu.edu.